Map of White Oak Bayou. Courtesy of the Harris County Flood Control District. Image available on the Internet and included in accordance with Title 17 U.S.C. Section 107. 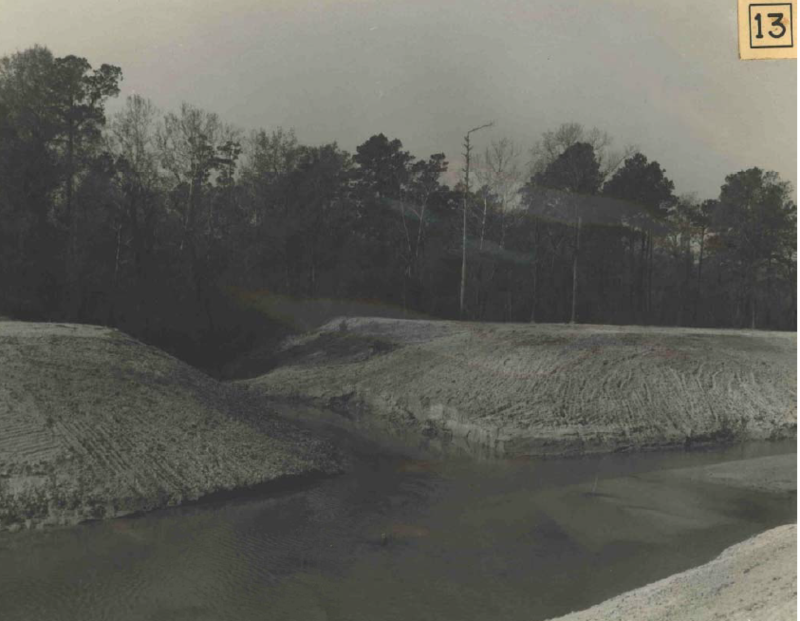 White Oak Bayou during channelization, 1955. Courtesy of the Harris County Flood Control District. Image available on the Internet and included in accordance with Title 17 U.S.C. Section 107. WHITE OAK BAYOU. White Oak Bayou rises just east of Satsuma in north Harris County (at 29°56' N, 95°38' W) and runs southeast for 31½ miles to its mouth on Buffalo Bayou (at 29°46' N, 95°21' W). The bayou runs through flat to rolling terrain with local dissections and deep to shallow sandy and clay loam soils. It is partly flanked by the heavily wooded area of northern Harris County but also passes through a densely populated area of the city of Houston. As one of the city's major bayous, beginning in the 1970s White Oak Bayou suffered from flooding and pollution problems as a result of the unusually rapid growth of the Houston metropolitan area. By the 2010s the White Oak Bayou watershed served a population of more than 430,000. Aerial View of White Oak Bayou before channelization. Image available on the Internet and included in accordance with Title 17 U.S.C. Section 107. In 1998 the Harris County Flood Control District and the U. S. Army Corps of Engineers began the multi-year White Oak Bayou Federal Flood Damage Reduction Project in the effort to control flooding through channel conveyance improvements, the construction of stormwater detention basins, clearing of invasive vegetation, planting of trees to prevent erosion, and other measures. The Jersey Village Channel Project, for example, was completed in 2010. Additionally, in the 2010s the Houston Parks Board and other partners constructed hike and bike trails as part of an ongoing project to transform the waterway into the White Oak Bayou Greenway to offer a “ribbon of greenspace” for approximately fifteen miles along the bayou. Harris County Flood Control District Projects & Studies: White Oak Bayou (https://www.hcfcd.org/projects-studies/white-oak-bayou/), accessed January 18, 2017. Houston Chronicle, November 29, 1985. Houston Parks Board: White Oak Bayou Greenway (http://houstonparksboard.org/projects/white_oak_bayou_greenway/), accessed January 18, 2017. Handbook of Texas Online, Rev. by Laurie E. Jasinski, "WHITE OAK BAYOU," accessed April 20, 2019, http://www.tshaonline.org/handbook/online/articles/rhw02.